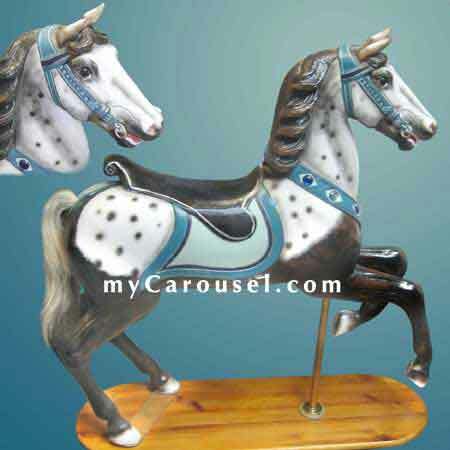 Turn of the century petite Heyn carousel horse in the prancer configuration. Painted as a black Leopard Appaloosa this elegant small figure features a glass eyed head supported on an upraised neck with five skein mane in high relief. Restrained trappings include a black saddle with volute cantle resting on a simple bordered blanket, a jewel punctuated breastband encompassing the chest, and a buckled headstall with metal bit ring - all in shades of blue with decorations painted in sliver. The horse, in very good condition, is furnished with a natural horsehair tail, retains its stirrup brackets and is presented on a wooden display stand with brass pole. 46 long x 50 high. 32 chest to rump.